I was 15 years old when my mom purchased an old Catalina 27 sailboat. She had always dreamed of having her own boat since she visited Greece in her teens. Of course I was happy for my mom; she sacrificed a lot to provide for my brother and I —It was good to see her do something for herself. Despite my mother’s cheerfulness at her new possession, I was secretly less enthused. Boats make me sea sick and the briny smell of the ocean doesn’t help either. An other unpleasant surprise was the way the ocean’s stench clung to the original mid-seventies upholstery. Sure, it was a fixer-upper, but my mom seemed pleased so I didn’t complain. My first time visiting the marina where our boat was docked was an experience. The marinas of Vancouver are like little ecosystems that closely resemble neighbourhoods. Except your marina neighbours are somewhat saltier— Like Dave, a man who lives on his boat and is always cleaning it, day in and day out. He also gives us unsolicited advice on how to clean our boat too. I think he would probably scrub down the whole marina if he could. Or Steve, a middle aged man who lives on a house boat and takes his cats for a walk everyday. How he trained two cats to not run away is beyond me. There are many surprises that come along with an old boat. In the first few days we had an incident of phosphorescent plankton in the toilet— for a moment, I thought the boat was on fire. The electrical was questionable at best and the only form of ‘modern’ entertainment was an 8-track player. The boat had (and still has) many problems but it wasn’t until we set sail the next morning that I began to enjoy the boat despite its shortcomings. I have often walked the streets of Vancouver. I love the way you can always see the mountains; you are surrounded by a massive metropolitan, but you are always reminded of the adventures that wait just outside the city. Although I had walked Vancouver’s streets for years I never felt truly connected to the city until I saw it from the water. Being anchored on the waters of False Creek is a surreal experience. I could hear the cars, see the lights surrounding me like an urban aurora borealis. I could hear the faint tittering of people on their evening walks and the waves lapping at the sides of the boat. Yet somehow I was separated. On my own secluded island; silent and tranquil. It’s odd being in the middle of a city yet not feeling like you’re in the city at all. I had never seen Vancouver from that perspective. From the water you can see the entire city from the ground up; every wave, dock, person, street and every floor of each skyscraper. Being removed from Vancouver allows you to appreciate it in its entirety. Seeing Vancouver in a whole new light made me appreciate this city even more, despite any shortcomings it may have, I know the people here are innovative, caring and dedicated to making and keeping this city the most beautiful place on earth. 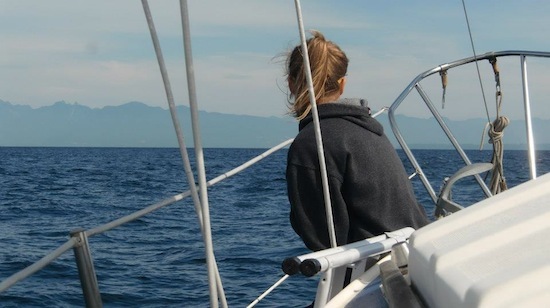 It took a rickety Catalina 27 to make me realize that I want to make Vancouver my home.